The most popular heat-set premixed paints in the reborn world, featuring Authentic Reborn premixed paints and complexions. Each petite jar comes with 5 grams of paint. This Authentic Reborn brand premixed paint set includes 9 jars of the most important colors reborners need, already mixed to just the right shades in the jar. Authentic Reborn premixes make life easier with paints that are just the right color every time. This set contains all the essential colors so you won't have to spend a single minute of your doll-making time mixing paints and correcting colors. Are you used to mixing colors? If you run out of a paint mix, you know how difficult matching can be! That kind of issue is a thing of the past with Authentic Reborn premixes. Just order another jar of premixed paint and you are ready to pick up where you left off with just the right premix.It gets better, though. Authentic Reborn paints and premixes are already just the right transparency, too. No need to use any thinner with Authentic Reborn paints! We reccomend using Genesis Glazing Gel to add the look of moistness to the lips, nostrils, eyelids and inner ears. 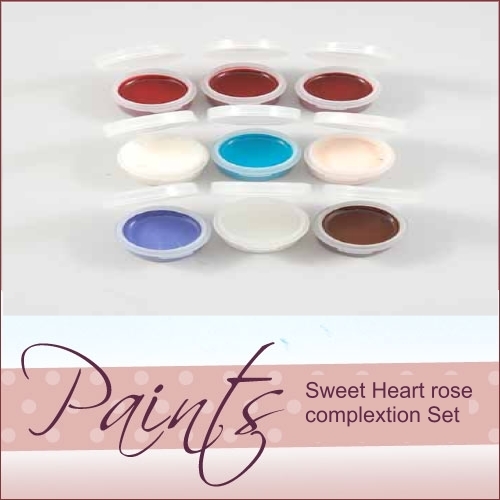 Glazing Gel is not included in the Genesis Petite Pre-Mixed Paint Set but is available separately.